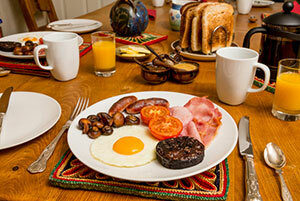 We provide a choice of breakfast options either a full Scottish cooked breakfast or continental breakfast. Fresh fruit, fruit juice and cereals are provided for all guests from a buffet table. We can provide breakfast items for vegetarians and guests with some food allergies. Please let us know in advance for food allergy requests. There is an excellent outdoor shop in the village where bicycles and canoes are available for hire. The Lochleven B&B Killin – and it’s owners – were absolutely charming. My wife and I greatly enjoyed our brief (1 night) stay there. Our suite was clean and spacious. After a long and tiring day, the comfortable bed was exactly what we needed. Breakfast the next day was delicious and plentiful. Our hosts were keen to share their insights into the local attractions. They even had a binder of information for their guests. As a result, we managed to have a lovely 3-hr walk before a major rainfall hastened our departure. We saw the Falls of Dochart, a prehistoric standing stone circle, the ruins of Finlarig Castle, and the Moirlanich Longhouse (rare example of cruckframe construction). We would have gladly stayed another night had our travel plans permitted. If you are ever looking for a place to stay in Killin, this is the one. The house and the room are very nice. The bathroom is modern. The hosts are very friendly. Breakfast is heaven! So many things to eat! The location is perfect. Killin, the town, is so lovely. Everything is so good about this b&b! We stayed there only one night but it was one of the best b&b’s during our recent trip through Scotland. We absolutely recommend it! Finding Lochleven on Main St was easy and they had parking behind their home. Our room was clean and neat. Had a sink in the room. The two guest suites were in their own hall with a door that closed off the suites from the hallway upstairs Medium sized twin bedded room with our bath just steps down the hall, The bathtub had a hand held shower head. Large bathroom with a heated floor! Shampoo, conditioner, hand soap and bath soap were provided. White bathrobe provided and ample hooks on the bedroom door. The beds were comfortable with lovely, soft duvets. A window overlooked the quiet village street it was a little difficult to find a plug and a strip we brought worked well in the socket for the bedside lights. We disconnected those to use the plug. Breakfast was amazing. We signed up the night before for what we wished to have. Homemade marmalades were a big bonus. Had everything and more we could have hoped for in a full Scottish breakfast. Thank you Chef Frank! The breakfast room had momentos from their many travels. They served us with silver flatware and Waterford crystal pitcher for water. How nice! Both hosts were wonderful. Margaret helped us right away with routes to take in town. They had local maps ready at hand, and we took the hour walk they recommended. The Falls of Dochart are beautiful and plenty of large rocks abound for those wishing to scramble around. We saw the standing circle of stones which you can enter, though we had not been sure. The walk through the countryside and the village was idyllic. We walked to everything in town. We went to the coop just down the road walking,to purchase cheeses and drinks for the next day. Would stay here again for the hosts, the location, and the lovely room. Hi ! We are a couple who booked a room there. As we travel on a budget we booked the cheapest room: a nice twin room. But as soon as we arrived Frank welcomed us and offered us the big double room for the same price (as it was available this night). The room is clean, very cosy, very beautiful, and really comfortable with a great bubble-bath. The breakfast is excellent and really filling. The BnB is centrally located and Frank is full of good infos about Killin. The photo exhibition in the veranda is a great idea as well !